Bring a large pot of lightly salted water to a boil. Add pasta and cook for 8 to 10 minutes or until al dente; drain and set aside. In a large bowl, combine ricotta cheese, eggs, Parmesan cheese, parsley, basil and ground black pepper. Stir to blend; set aside. Heat oil in a large saucepan over high heat. Saute onions for about 5 minutes, stirring occasionally; add carrot slices and saute about 2 minutes, then stir in green bell pepper and broccoli. Stir all together, reduce heat to medium and cook until tender, about 5 minutes. Scrape veggies into ricotta mix and mix well. Ladle 1 cup of spaghetti sauce into a 9x13 inch baking dish and spread evenly over the bottom. 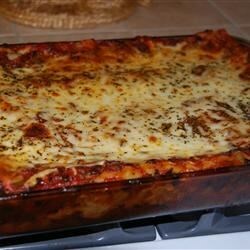 Place 2 strips of lasagna lengthwise in the dish, then spread about 4 cups of the filling over the pasta. Sprinkle 1 cup of the mozzarella cheese over the filling; repeat layers. Bake at 350 degrees F (175 degrees C) for 1 hour; let stand about 15 to 20 minutes, to firm up, before serving. See how to make a top-rated beefy lasagna. Very easy to make and a healthy mix, but a bit bland. I'd recommend adding garlic and some oregano. Very good recipe. Everyone liked it. I added minced garlic and zucchini to the veggies. I do have to say that you do not need nearly as many lasagna noodles as the recipe calls for, though. Good recipe. I used the entire bag of broccoli for the 6 servings size and it turned out okay. Next time I will make sure that the lasagna edges have sauce on them so they won't get hard.